The community of Littleton has joined together in honoring the Littleton servicemen that have paid the supreme sacrifice in all wars. Fifty men have been killed in action through the years. 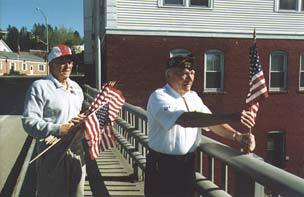 Last year the New Hampshire House of Representatives and New Hampshire Senate enacted a law naming the bridge on Cottage Street at the Town Building "The Veterans Memorial Bridge" honoring all veterans over the years who have served our country. This was signed into law by the Governor. In the History of Littleton, New Hampshire, Vol. 1. Annals 1905 the historian states, "While we have been generous to lavishness in voting largesses and in providing for the material wants of these men and their widows and children, we have been oblivious to all else. Their trials, sacrifices, and dangers, their wounds and the glorious death of not a few, demand something more from their townsmen. The spirit of materialism, now dominant, will pass away, and then shall be ushered in the reign of sentiment, and under its benign and peaceful sway the town will erect an enduring memorial to the memory of her heroic sons who offered their all upon the flaming alter of their country." Research over these past years has indicated that 21 were killed in action in the Civil War, 11 in World War I, 9 in World War II, 7 in the Korean War, 1 in the Vietnam War and 1 by terrorist act -- totaling 50. 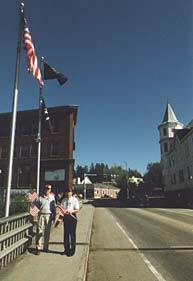 Individual plaques measuring approximately 7" x 9" have been installed on each of the uprights of the bridge honoring each soldier. Flag holders have been installed and these flags will be above the individual plaque. 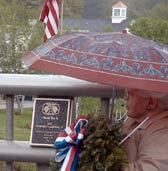 A larger plaque has been installed on the wall of the Town Building naming the "Veterans Memorial Bridge". Each of the organizations in town is being asked to participate in the fundraising of this project by soliciting their members for contributions to the fun and also to having a fund drive. In this way it is felt that every Littleton resident will have the opportunity to contribute to honoring these men. There will also be a plaque honoring these who died in the service of their country by other causes: flu, pneumonia and typhoid -- to name but a few. A Littleton project, honoring Littleton's own. 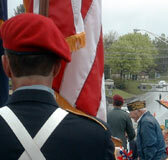 The Town of Littleton and its residents are proud to honor these men.